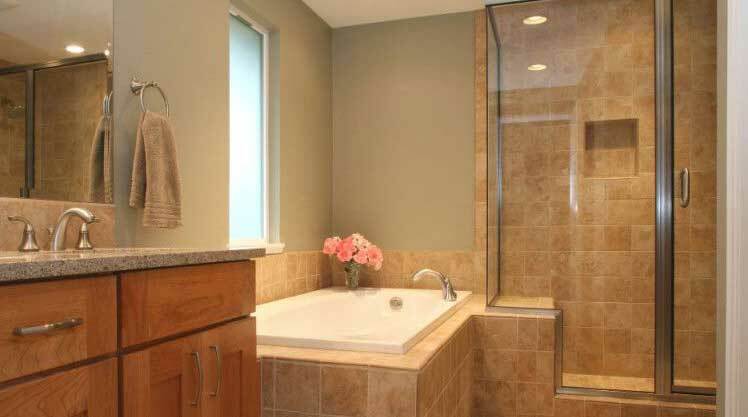 Racine Roofing and Remodeling provides bathroom remodeling services in Racine, Kenosha, Sturtevant, Caledonia, Milwaukee, and Franksville, as well as all over Wisconsin. Bathroom remodeling and installation can solve a number of problems in your home or commercial building. It can improve your bathroom storage situation, mold or mildew problems, and general safety concerns in your home, and provide employees and customers with special attention that can help build rapport and loyalty. The bathroom is one of the most trafficked rooms in a home, so at Racine Roofing & Remodeling, we make every effort to suggest personalized and durable options to meet your bathroom remodeling needs, but whatever you decide, we are here to help with your master bathrooms, guest bathrooms, and powder rooms, each of which generally has its own unique set of features. Also, commercial buildings include additional fixtures that you don’t find in your home, such as urinals, stall walls, and high power hand dryers. When determining the scope of your bathroom remodeling project, there are a few things you should consider, such as space limitations, desired materials, and the function that will best support your household or commercial activities. Bathroom storage is in constant demand, so vanities are getting bigger and bigger, but if space is limited, consider recessed or built-in designs that help save elbow room while adding storage space for your toiletries and more. Features that allow for better safety are in high demand as well, such as walk-in tubs, which offer no-leak doors, comfortable seating, and sturdy, reliable hand bars. We want to be sure you enjoy your time in your bathroom with proper lighting, safe and efficient fixtures, etc., as well as a great paint job. Decor adds the finishing touch to your bathroom design, and even a toilet paper holder can add to the style of your bathroom. If you aren’t looking to do a full renovation, smaller scale bathroom design ideas can be achieved by swapping out some of your old accessories or changing the color scheme. Come to us with all your bathroom remodeling ideas, and we will work with you to discover and uncover the bathroom of a lifetime. Be sure to enjoy your time in your bathroom with proper lighting, safe and efficient fixtures, as well as a great paint job. Tired of sharing sink space? We can help!